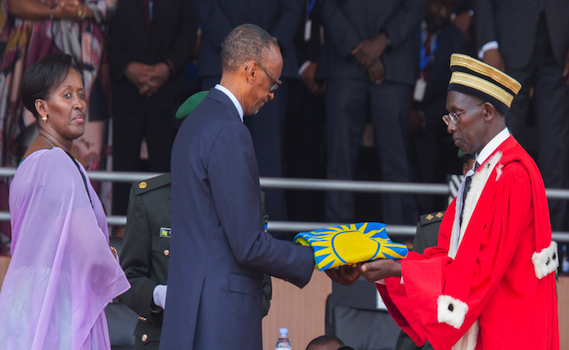 President Paul Kagame has been sworn in as the President of the Republic of Rwanda for the third term. He will serve as President for another seven years. The swearing-in ceremony took place today August 18, 2017 at Amahoro National Stadium and was attended by Heads of State and Government, many others delegated by their Heads of State, such as Vice Presidents, Prime Ministers, Ministers of Foreign Affairs, religious representatives, citizens and other dignitaries such as Liu Xiaofeng, Special Envoy of China. The swearing ceremony was administered by Chief Justice Sam Rugege who presented the President with the national symbols including the national flag, the constitution and the national emblem. Below is his inaugural speech. Today is a day of renewal and gratitude. I would therefore like to begin by thanking those who have joined us here. The presence of so many brothers and sisters from around Africa, Heads of State and former Heads of State, honours our nation deeply and gives us strength. We thank you. Africa has been with Rwanda when we needed you most and nothing gives our people greater pride than contributing, together with you, to the greatness of our continent. Standing alongside us today are numerous friends of Rwanda from around the world who have always kept our country in their hearts and worked hard to advance it. We welcome you home. I want to acknowledge the leaders and members of the eight other political parties who joined with the Rwandan Patriotic Front to nominate me as their candidate. For twenty-three years, we have collaborated closely and with deep mutual respect to repair the social fabric of our devastated nation and bring us to where we are today. I also congratulate the two other candidates who brought their message directly to our citizens. Together we created a positive environment where no vote was cast against anyone, but rather all were cast for Rwanda. If we always succeed in rallying so strongly around the ideas and the leadership that work best for all of us, it would be a very good thing. This approach is not merely a stepping-stone away from our moment of tragedy. This is who we are. It is our ideal for this time, and all the time. I would like to express particular appreciation to all Rwandans for renewing the trust between us. More importantly, you trusted yourselves and each other. It is truly a privilege and an honour to serve you. Together we have lived a life, which at every turn has been unexpected, unprecedented, and often shocking. Yet we have made progress, thanks to the distinctiveness of our choices and the resilience of our people. We have worked incredibly hard to rebuild our nation in a spirit of consensus, while leaving no one behind. In particular, our women and men have equal rights and opportunities. Today, Rwanda defines no one as an enemy, whether domestic or foreign. Every Rwandan has a country, and with every other country, we seek partnership and cooperation. Rwanda’s institutions are founded on the common good, as it should have been all along. The gains in public services, individual well-being, and national unity are now undeniably real. The enthusiasm and emotion expressed throughout the campaign is rooted in these realities. Every attempt that was made, whether from within and especially from outside, to denigrate the process and glorify the old politics of division, only made Rwandans more defiant and more determined to express ourselves through the vote. All along, we have had to fight to protect our right to do what is best for us, and we will, without any doubt, continue to do so. In this regard, Rwanda is not an exception. Every African country has to contend with efforts to force us to live on someone else’s terms. They demand that we replace systems that are working well for us with dogmas in which their own people are rapidly losing faith. Africa has no civilizational problems, only assets. Over centuries of adversity, our civilisation sustained us. Today it endows us with ambition, compassion, and creativity. Without exception, there is infinitely more that unites us, as Africans, than divides us. It is important for Rwandans and our fellow Africans to feel reassured that attacks on our character only make us stronger, provided we respond with clarity and conviction. Our experience is that we will be vilified anyway, no matter what. So we might as well do what we know is right for our people, because the results are much better, and the costs are much lower. Those who are worried about our welfare should feel at ease. We are the best students of our own shortcomings. Much as we have lost a lot of time, more recently we see that it is no longer business as usual in Africa. There is really no justification for all the effort that goes into cutting Africa off from itself, as if sharing lessons and experiences with one another might be harmful, without adult supervision. There is no single model for nation-building. At the root of any success are good choices, built on a mindset which can be summarised in three words: Do It Yourself. That is what we have done in Rwanda, and it is all any country needs to do to bring everyone together to chart a path into the future. To that end, we in Rwanda will continue to be firm believers in real partnership and cooperation with friends around the world, which has benefited us a great deal and which we deeply appreciate. During the campaign, there was a Gospel song that an ordinary Rwandan adapted. It captured the joy of being together after having survived so much. It goes on to say: When we are fighting for a just cause, there is no reason to fear anything whatsoever, because God is always on our side. This speaks to all of us in Africa. Translating he song into English, it is called “There Is No Fight That Scares Me”. As Africans, as brothers and sisters, let us work together more closely. The governance and prosperity of Africa cannot be outsourced. Let’s build on the reform spirit that has taken root in the African Union, and indeed in every African country, to quickly deliver the results that our people expect and have been waiting for. Africa is on the right path and we are going to do just fine. The next seven years will be very important for our country. Our priority is to deepen the moral pact with all the young women and men who voted for the first time, and with such passion. Everyone saw how they took the lead during the campaign, and actually made it flawless. I want us to recognise you for that. The ambition of these young men and women is remarkable. We see your determination to work hard, achieve a lot, and become the pride of your families, as well as an asset to the entire nation. We must ensure that Rwandans have high-quality education that fully equips us to compete in the services and industries of the future. The role of our private sector is absolutely central. The Rwandan entrepreneurs and business leaders, who started from zero, have transformed our country for the better and laid a solid foundation. We thank you, and also ask you to please do even more. Government will do its part to increase regional and continental integration and promote the free movement of Africans, while investing in strategic infrastructure and technology. Rwanda’s prosperity and security, after all, depends on the security and prosperity of all our neighbours, and beyond. Our commitment to the future must be sealed with a mindset of ownership, responsibility, and problem-solving. All the inspiration we need is right here in Africa. There is exceptional leadership and ingenuity amongst us, everywhere, only that we have been accustomed not to recognise it as such. Choosing to see the value in each other is a precious gift, which anchors us firmly and confidently in our rightful place in this world. Let’s ensure that those who struggled and perished to build this new Rwanda, and to liberate Africa, did not sacrifice in vain.